We found a horrible story on the web, but luckily it ended well. 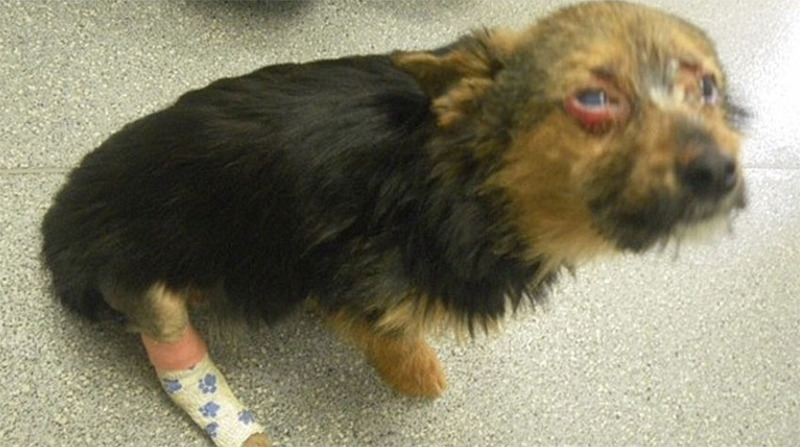 Four teenagers stole a small puppy in front of one of the houses, and then tortured him. They gave the dog drugs, and then they even lit him on fire. When all was enough, the injured puppy was thrown into the trash bin. "This was the worst thing I've ever seen: these guys were probably under the influence of drugs, but what they did to our Chunky is shocking. The dog was found with broken legs, his body was full of scars," said Caroline Doe, an employee of the animal welfare and protection organization. Despite the terrible experience, the dog Chunky managed to survive. The police quickly found the teenagers, but the punishment, according to many, was not enough. They will not be allowed to have domestic animals for five years, and they had to pay the medical bills of injured puppy from their pockets. See how Chunky dog looks today in the hug of his loving owners! Would teenagers deserve a higher penalty for such a cruel act?